Volunteers will be gathering to give an area of Bournemouth a makeover this Saturday, clearing litter and overgrown bushes to develop a new feature for Lansdowne. A path off of Christchurch Road in Landsdowne is currently overgrown and littered with rubbish. 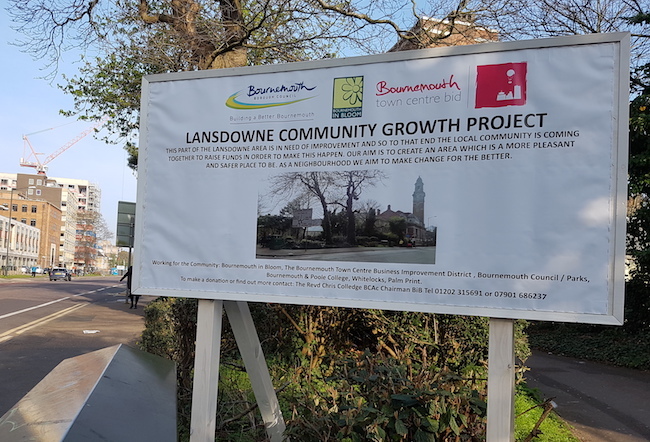 But volunteers and local councillors are being asked to come together for the Lansdowne Community Growth Project, to help give the trees a trim and clear the area of litter. Bournemouth in Bloom have been leading the initiative with the support of Bournemouth BID, following the success of a similar project on West Cliff’s Durley Chine Road. Bournemouth in Bloom chairman Reverend Chris Colledge said: “It’s not just about changing an area and growing things – it’s about growing together as a community, of people coming together for a purpose of an improvement to their local area. The first stage of the project will be beginning on Saturday 1st April at 10am, with the group cutting back all the overgrowth. Volunteer litter-picking group Dorset Devils will also be at hand to help clear the hundreds of bottles, tins and cans that have accumulated in the area. “That will be the beginning of the transformation of this rather unclean and unsightly site, and the community coming together to grow together,” Rev Colledge said.